Sweet N Low 400 Count Box. 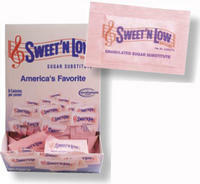 These boxes of Sweet n Low provide the perfect blend of quantitiy and functionality. The box is designed to be used on a counter top or in a cabinet as a distribution container. Just pop open the perforated flap!